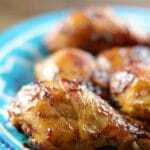 Honey bbq wings super crispy , healthy right from the oven without frying. 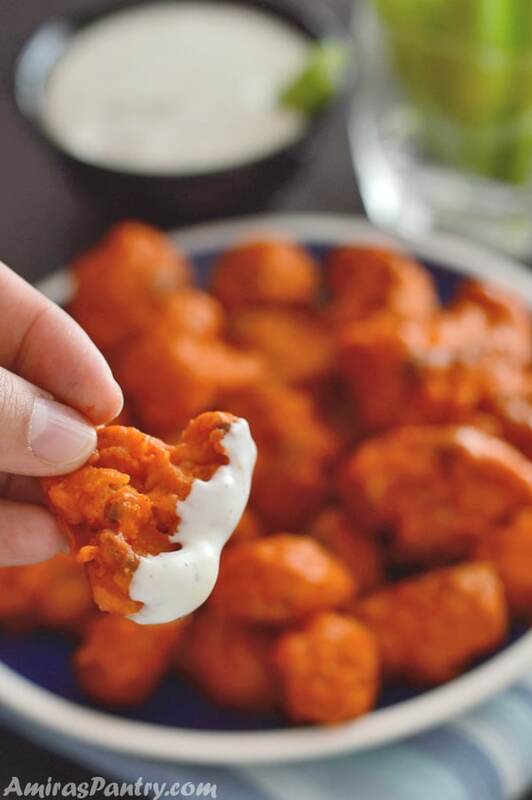 Perfect as a game day appetizer or for any party you have. 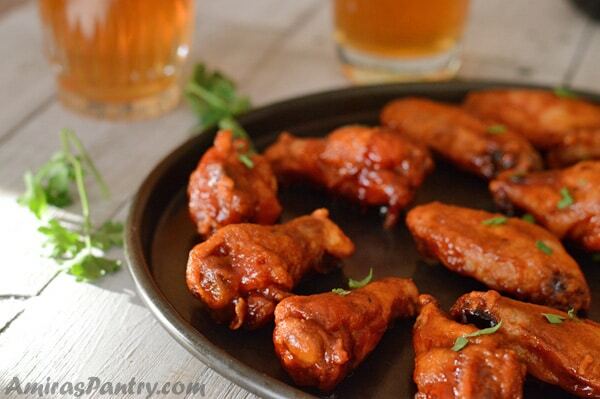 These honey barbecue chicken wings are finger-lickin’ good!! 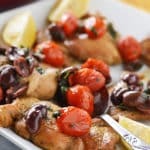 Try this amazingly juicy, full of flavor Oven BBQ drumsticks. You won’t need a deep fryer to make them extra crispy. 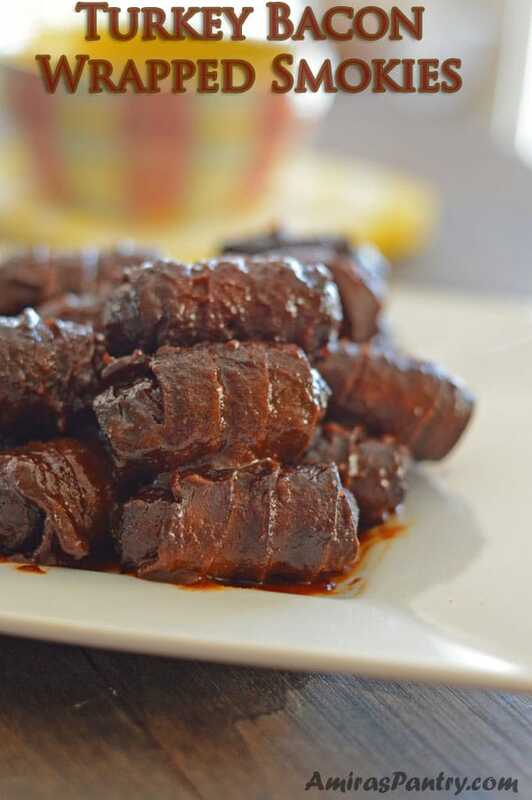 These are very good on their own or dipped in this sweet bbq sauce. Add some hot sauce to the mixture to spice them up a bit. 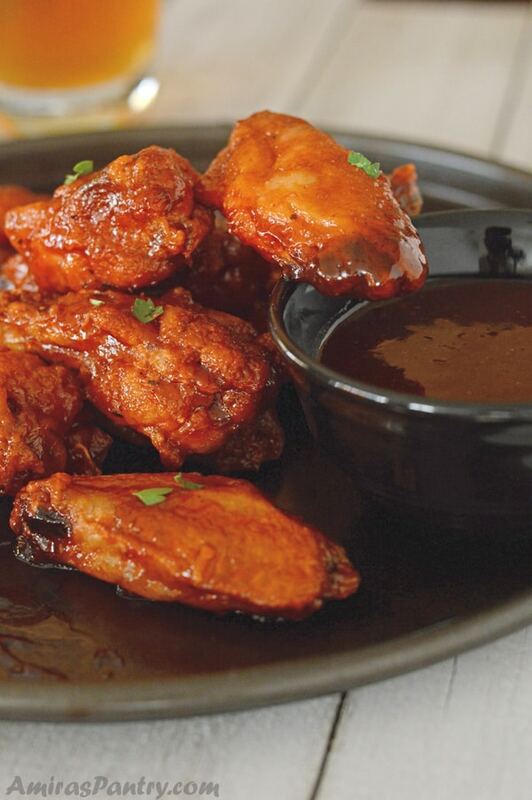 These finger-licking wings will definitely wake up your taste buds! Ages ago, 10, or probably even 12 year go, if someone had told me that I’ll be eating chicken wings AND FEED THEM TO MY CHILDREN, I would have said that’s crazy. Not just crazy it is disgusting濫!!. All my past life, that is before stepping in the US, my mom had told us that chicken wings should be discarded. No body, that I know of , in Egypt eats a whole plate of chicken wings. If someone bought chicken wings in Egypt, she/he probably was planning to feed stray dogs . So why do you think Egyptians, or at least my mom and her mom and her mom …., do not like chicken wings and think they are unhealthy? This is because many industrial chicken raisers inject chicken in their poor wings with hormones to make them grow bigger. 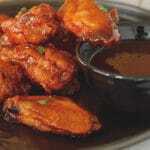 Hence it is believed that wings are the part of the chicken where all toxins reside. Is this true? I have no idea. The only objection I could find relies on how fatty they are because of all the skin, fat , sauces, blue cheese dipping and of course …. deep frying. Hmm, so what exactly is a super bowl?! 樂 . Yesss, I felt like an alien . So, if you have an Egyptian friend, and I think any Middle Eastern, who just came from Egypt, DO NOT feed them chicken wings unless you know they are open minded and willing to try new things. This will leave a bad impression and they will think you are feeding them leftovers hehehehehe. Do not say I didn’t warn you 路. There are two ways to get them nice and crisp. This is what I have used in this recipe, which is using baking powder. Simply pat dry the wings let them rest in the fridge uncovered overnight to get them really dry, then coat them with baking powder and salt. Parboiling, which is a fancy name for partially cook the wings in some simmering water. 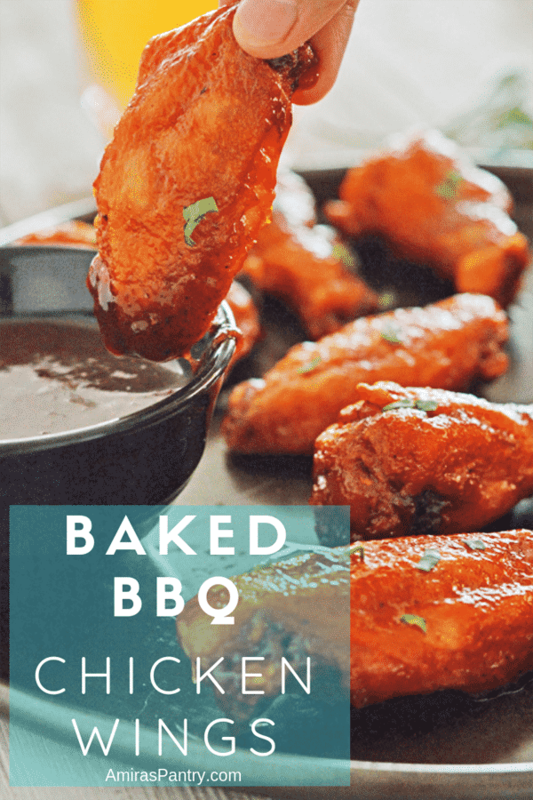 This allows for a lighter wings of course as it allows you to get rid of some of the fats in the wing itself and it reduces the cooking time in the oven. You’ll parboil the wings for 7 minutes then let them dry very well and bake them in a very hot oven. How long do you cook chicken wings in the oven? We’ll need to cook the wings on low (275F) for about 30 minutes until the baking powder works its magic. It will draw the moisture out of the fat so we end up with a thin layer of fat which allows for a crispy skin rather than ending with a flabby thick layer. After those 30 minutes we will turn the heat up to 425F and let it crisp nice and golden for about 40 more minutes. 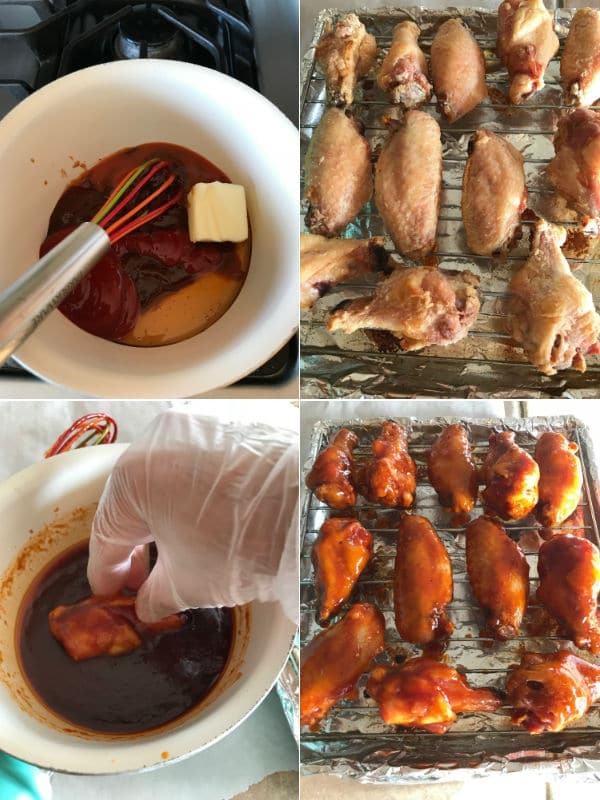 How to make crispy oven baked honey bbq wings? Start by drying the wings’ skin. After washing them, you pat them dry and then dry them in the fridge for a couple of hours and preferably overnight. This technique will result in a very crispy skin without a drop of oil. Then in a zip-lock combine the wings, baking powder and slat, shake well to cover evenly. Bake wings in the oven on low heat(275F) until it gets crispy and light brown . Increase heat and bake for additional 40 minutes. 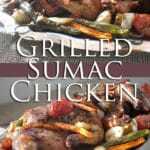 While they are baking make the sauce by combining sauce ingredients well and simmer on low flame for about 13 minutes. Take the wings out and dip them in the sauce, return to oven for an extra 3 minutes. Beautifully crispy baked, saucy, smoked and hot with a little sweetness. My kids devoured these wings in a matter of minutes and I got just a taste of the one wing that my husband managed to get his hands on :). I hope my mom will forgive me for this recipe, I am sorry mama but these are really delicious. I hope that I will convince you to taste these one day, I am sure you will be hooked. 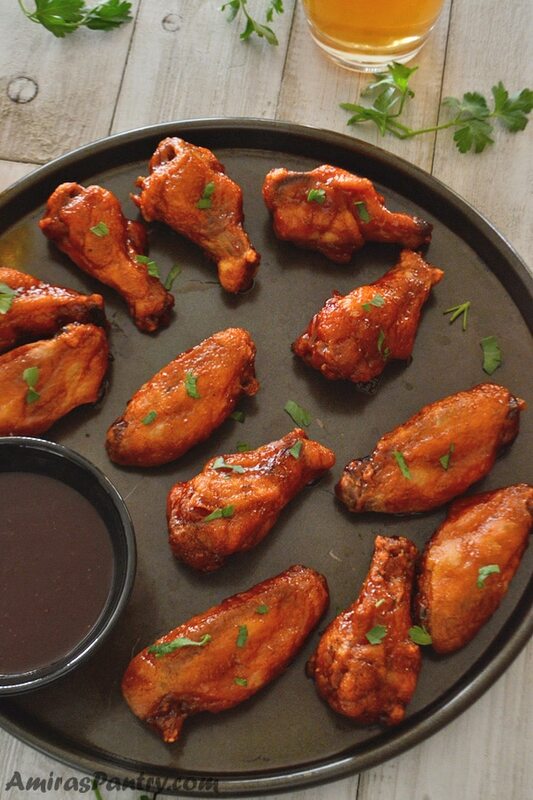 Smoky, crispy sweet baked chicken wings. The perfect appetizer for any occasion. 2 lb chicken wings about 12 pieces. Preheat oven to 275F. Place two oven shelves one in the lower quarter and another on the upper quarter of your oven. 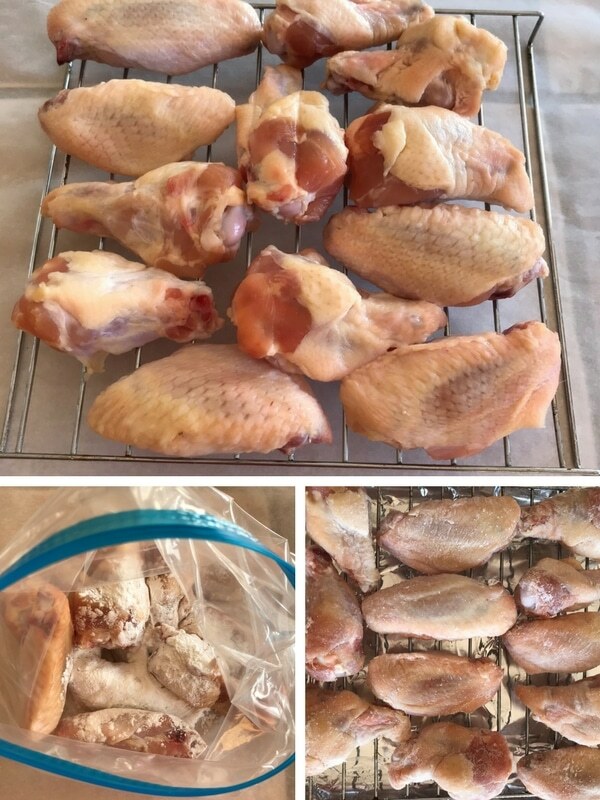 Place wings in a one gallon ziplock with baking powder and salt, Shake to cover wings evenly and make sure no thick clumps of baking powder forms. Line the baking sheet with aluminum foil, and spray your rack with oil. Arrange wings on the rack skin side up. Place the rack in the baking sheet. Put the baking sheet on an oven shelf placed in the lower quarter of your oven and bake for 30.minutes. Move the wings to the upper shelf and increase temperature to 425F. Bake for another 35-45 minutes or until the wings are crispy and lightly browned. Simmer everything on lowest flame in a small saucepan for about 15 minutes. 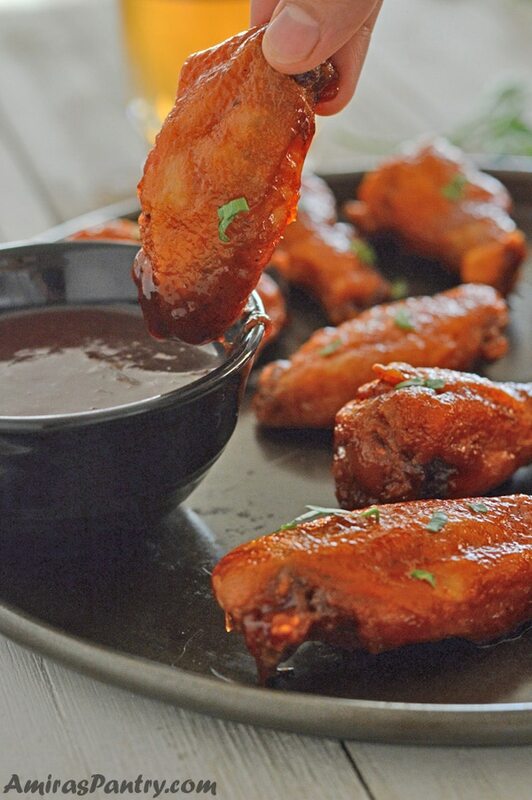 When wings are done, carefully dip them in sauce and place them back on the rack. Pop them again in the oven for 2-3 minutes. Serve immediately with your favorite dipping sauce or plain. * Make sure to use baking powder not baking soda. ** Adding hot sauce is optional so add to your liking. *** If you do not have time for that then make sure to dry the wings as possible as you can. Spread them on kitchen towel and pat dry well all around. 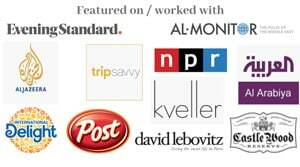 thank you so much for all the wonderful Recipes. Karima, I haven’t tried this method on legs.. I will dig deeper and tell you. Hang in there :). That baking powder trick is interesting — haven’t heard of that. Good looking recipe. I’m not a real fan of wings, but do like the flavor treatment they usually receive. Good recipe– thanks.